Chronograph watches allow you to measure time using the stopwatch function (start-stop button usually at the 2 o'clock position). Many chronograph models are equipped with the tachymeter scale on the watch bezel or surrounds the dial. It tells you the traveling speed over a fixed distance in km/hour or miles/hour. You can also use it to measure a production process in units/hour. 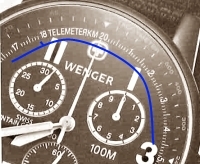 While the scale markings may look complicated at first glance to the uninitiated, reading the tachymeter is really easy. Here's how. Start the chronograph at a starting line or marker. Stop the chronograph at the next kilometer or mile marker. The value on the scale at which the second hand is pointing indicates the speed in km/hour or miles/hour depending on the unit of distance used. For example, we want to know the speed of a moving car. Start the chronograph when the car passes a predetermined starting line or marker A, and stop the chronograph when the car passes the next line or marker B, 1 km (or mile) away. The second hand is pointing at 6 o'clock. Read the tachymeter value at that position and it shows 120, telling us that the car was traveling at a speed of 120 km/h (or miles/h). What if the distance is less than a km or mile? No problem, but a little simple calculation is required. For example, we want to know how fast a 200m athlete is running. Start the stopwatch when the race starts, and stop it when the athlete crosses the finishing line. Let's say the athlete crossed the line at 20 seconds. 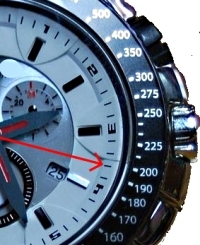 The tachymeter value at the 20 second mark (4 o'clock position) shows 180, which means 180 km/h if the distance timed was 1 km. But the athlete only ran one-fifth of a kilometer. Therefore, we need to divide 180 by 5 (1/5 of 180) to get 36 km/h, which is the speed of the athlete in that 200 m race. What if the object is traveling very fast? Again, a little simple calculation will do. Let's say an aircraft took 35 seconds to cover a distance of 10 km. 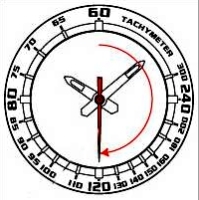 The tachymeter shows us a speed of 100 km/hour at the 35 seconds mark. However, 10 km have been traveled. Therefore the speed of the aircraft is 100 x 10, which is 1000 km/h. If the production process takes 18 seconds to churn out one unit of product, the tachymeter value at that position reads 200. This means the process has a production output rate of 200 units per hour. 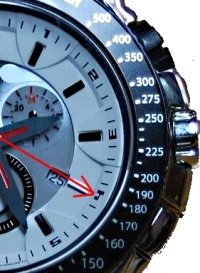 Some watches are equipped with the telemeter scale, which tells you the approximate distance between the user and an event that can be both seen and heard. The scale is usually defined in kilometers or miles depending on the watch model. Examples of events that are seen and then heard are lightning and thunder, fireworks and artillery firing. Here's how to use the telemeter. Start the stopwatch when the event is seen. Stop it when its sound is heard. The telemeter scale value at which the second hand is pointing is the approximate distance between your position and the event. In the example shown, the distance is 8.7 km. The telemeter scale makes use of the principle of the speed of sound. Although it is not a constant value since it is affected by factors such as altitude and temperature, the speed of sound can be specifically calculated using mathematical formulas. 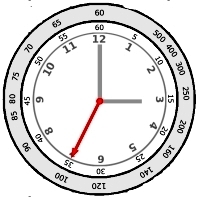 As such, telemeter scales on chronograph watches are generally calibrated based on the speed of sound at sea level, which is calculated to be approximately 340 m/s. At the 30 seconds mark, the telemeter tells us the distance to the artillery firing (heard 30 seconds after sighting the firing) is approximately 10 km. If your watch is not equipped with a telemeter scale, you'd still be able to find out the approximate distance to an event that is seen and then heard. So, knowing the speed of sound to be 340 m/s and the time elapsed between the event seen and heard is 30 seconds, the approximate distance is therefore 10,200 m, which is 10 km as shown on the telemeter scale above. Copyright© World Military Watches Command All rights reserved.